New Zealand 0-131 (Hamish Rutherford 77*, Peter Fulton 46*) trails England 167 (Jonathan Trott 45, Ian Bell 24, Neil Wagner 4-42, Bruce Martin 4-43) by 36 runs. A deadly bowling from Neil Wagner and Bruce Martin followed by a solid opening partnership by Peter Fulton and Hamish Rutherford put Kiwis on top vs. England. England was bowled out for 167 runs after 55 overs in their first innings and the Black Caps powered 131 after playing 42 overs without any loss. 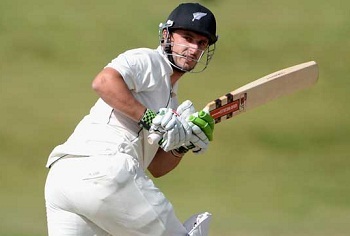 The first Test of the three match series commenced on Thursday, March 7, 2013, at University Oval, Dunedin. That was the second day of the match since the first day was washed out because of rain. Earlier, Brendon McCullum, the captain of New Zealand won the toss and put England in to bat. The decision paid off instantly as Nick Compton played on the ball into his off stump for a duck and was replaced by Jonathan Trott. The left arm medium fast bowler, Neil Wagner struck twice in the 11th over and removed the English captain, Alistair Cook along with the star batsman, Kevin Pietersen, on the subsequent deliveries at 10 and 0 runs respectively. The visitors were reeling at 3-18 when Ian Bell got together with Trott and they added two runs in the next three overs. Bell hit 2 fours in the 14th over as Trott kept on crawling from the other end as the score went past the 50 runs mark in the 20th over with 2 fours. The total was enhanced to 64 in 24.1 overs when Ian Bell was caught by Hamish Rutherford at short extra cover off Wagner for 24 runs. Joe Root departed seven runs later for just four runs as Matt Prior joined in with Trott who got 2 fours in the 29th over. The visitors reached 81 in 32 overs when lunch was taken as Prior opened up after the break and added another 5 fours in the 37th and next over. He did not last long and was caught by Kane Williamson at point off the debutant left arm spinner, Bruce Martin for 23 runs. Jonathan Trott became the next victim of Martin at 109 after contributing 45 off 121 balls with 7 fours. Steven Fin and James Anderson gave some resistance by scoring 20 and 23 runs accordingly as the entire team went back to the dressing room for 167 in 55 overs. Neil Wagner and Bruce Martin were the star performers with four wickets each whereas Tim Southee and Trent Boult shared one wicket each. Hamish Rutherford, the debutant, and Peter Fulton opened the innings for the Black Caps confidently. Rutherford hit 5 fours and Fulton 2 in the first eight overs and they continued consolidating the innings with regular boundaries. Rutherford was the most aggressive of the two, he dispatched the first six of the day in the 21st over and achieved his maiden Test fifty on debut on the third delivery of the 24th over. 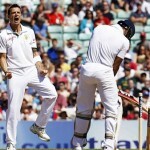 The English bowlers looked helpless as the first hundred of the Kiwis innings was posted on board in the 31st over. Hamish Rutherford got a life when he was dropped at 64 by Pietersen at point off Stuart Broad on the first ball of the 34th over. 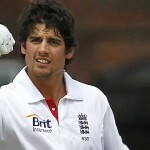 Alastair Cook utilised six bowlers to disengage the partnership but remained unsuccessful until stumps on day two. New Zealand smashed 131 runs with all their wickets intact whereas Hamish Rutherford and Peter Fulton were at the crease with 77 and 46 respectively. New Zealand looks like being in total command of the game and anticipates a deciding first innings lead whereas England will try to restrict the hosts within limitations.